This time last year I started investigating and comparing Cloud-Based Accounting solutions with a view to making the switch on 6th April 2013. When it comes to research I’ve always been a “no stone unturned” kind of guy – I’m the sort of person who buys What Toaster? Magazine, so I can find the very best contraption for making breakfast. I guess that’s what happens when you have an engineering background. My approach to researching Cloud-Based Accounting packages was no different; I signed up for several “Free 30 day trials”, emailed & phoned the company support teams with detailed questions, read articles online – and finally made my decision – to use FreeAgent. As business decisions go it was undoubtedly one of my best. Why did I switch to a Cloud-Based Accounting Software Solution? If you’re a freelancer like me, you don’t have additional personnel to carry the accounting burden and inevitably “doing your monthly accounts” can feel like a chore – gathering up receipts, painstakingly entering data into a spreadsheet, punching a calculator to work out your invoice totals etc. For more than 15 years I used a time-consuming, convoluted accounting system, operating solely on my local desktop computer; a combination of Spreadsheets and Word Documents alongside printouts of my bank statements. I also had a stapler and various highlighter pens working overtime. The advent of sophisticated cloud accounting solutions, in combination with increased internet access speeds and faster mobile devices made the idea of hosting and operating my accounts online look very attractive. Cloud accounting solutions such as FreeAgent give you global access to your accounts / contacts / invoicing / estimating and much more – wherever there is a web connection. 1. What it means to my business. 2. Why I chose it ahead of the other cloud accounting solutions. 3. How I use it on an everyday basis. I hope this review will save others the intensive research process that I undertook and give a flavour of FreeAgent and its benefits. I won’t go into all of the details and functionality – that would be far too lengthy and the company support pages and guides already do that brilliantly. I can only say it would be a painful regression. It would feel akin to having my Smartphone replaced with a landline – or having email replaced with snail mail. Somehow, back in the day, we all got by with landlines and postal services but imagine how our businesses would be affected if we went back to them now. It doesn’t bear thinking about. • It makes me more focussed on the needs of my business. • It speeds up the turnaround time for estimating/quoting – giving me a competitive edge. • It gives me a real time view of my future Tax and VAT returns since they are built up “on the fly”. • It improves the presentation of my business due to professional invoicing/estimating templates. 2. Why did I choose FreeAgent? Starting with the question “What’s the best cloud-based accounting software solution?” here are some criteria, in no particular order, which I used to compare the various packages. Please note that my comparisons were made in Early 2013. If you want to dive right in and see how I use FreeAgent with practical examples, please jump to section 3 below. Some of the packages I looked at used methods and terminology which weren’t immediately recognisable to me as a non-accountant. By contrast, FreeAgent looked like a VERY sophisticated (yet, easy to grasp) version of my old accounting system; Showing payments IN to my account from invoices etc and payments OUT of my account for Bills, Expenses etc. For me, this meant a quick transition from my old system. As FreeAgent say, it’s “Accounting for Humans”. Too true! Invoicing/Estimating templates (Well designed & Custom Template options). The 8 included FreeAgent templates (like all of their web design) are superb and present your business in the best possible light right out of the box. I also like the fact you can create your own “Custom” template if needed. As someone who has done some graphic/web design, aesthetics and layout were important to me. Some of the template offerings from other cloud accounting packages were aesthetically very poor and some almost impractical to use. Direct Bank Account feed & “Intuitive” Transaction Matching & Receipt upload. At the time I made my decision – FreeAgent was one of only two packages offering a direct connection to my bank account at First Direct (HSBC) via Yodlee. I use a personal bank account for my business and one of the biggest headaches with my old manual system was printing out my bank statements and going through them with a highlighter & pen marking the relevant transactions to match my receipts/invoices. With FreeAgent, the bank feed updates daily on screen and FreeAgent makes light work of matching incoming payments to invoices. For outgoing payments (e.g. for expenses, bills) – it automatically keeps an intelligent eye on previously logged items and if it sees a similar bank account transaction in the future it will suggest it for review as a possible expense. Rather than saving up the accounting for the end of the month – you find yourself marking these transactions as you go along as part of your weekly (or even daily) accounting. 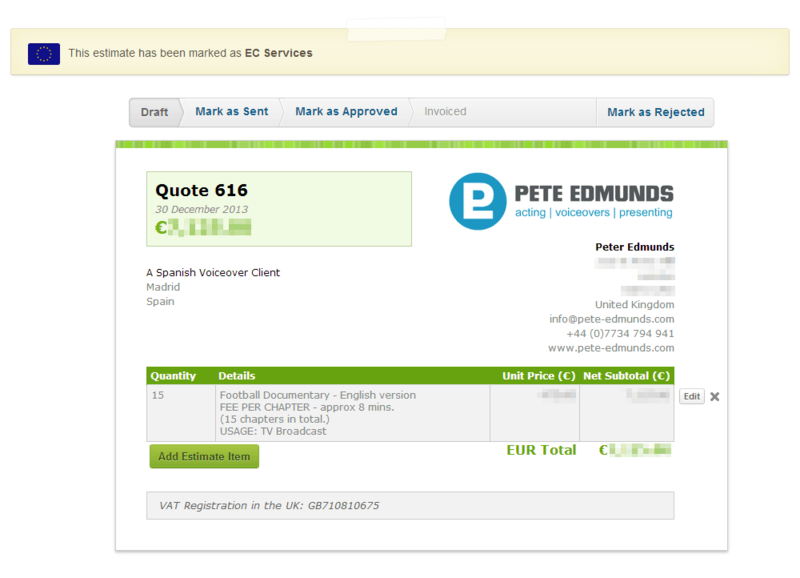 For expenses you can upload a receipt image which will be “paper clipped” alongside the transaction line for reference. No more piles of stapled receipts! (See mobile agent below for more on this). Alongside my acting & voiceover work over the last 15 years, I’ve also spent a great deal of time working as a facilitator/coach/role-player in Corporate Training and development – for customer service skills and communications skills amongst others. This work has created a strong sense of what “best in class” service and communication means. From my research emails and phone calls – the team at FreeAgent were head and shoulders above the competition. Their support team are extremely knowledgeable and their chief accountant has written various books on accounting and finance for small businesses. A Sense of Community, Flexibility & Fun. Beyond service and support emerged criteria that weren’t on my original list but something I liked about FreeAgent as I got to know more about them. There is a very strong sense of engagement and community. As you use their accounting system you realise they appear to have thought of everything – but if there are features you feel are missing or could be better – they listen to feedback; they adapt and implement changes if needed. They have a fun “depot” where you can see the roadmap of design work planned and currently being undertaken. They run frequent webinars and hangouts on the web, send out useful info-graphics and generally make you feel part of the FreeAgent family. Each Monday morning, the “Monday Motivator” email arrives in your inbox, giving you a friendly nudge to chase up invoices and estimates. I’m based in the UK so I chose a British made solution (FreeAgent are based in Edinburgh) – not for patriotic reasons – but because I felt a UK based solution provider would be better suited to understanding/keeping up to date with the nuances of the UK Tax System and because it would simplify any service and support communication. There are other Cloud accounting solutions based in UK but they didn’t stand out on other criteria at the time I made my decision. If your business is based outside the UK don’t let this put you off trying FreeAgent – their solution is also tailored to work with tax systems in various other countries. If cloud accounting is something you will be using every day (as I do) then it’s vital you are comfortable with the layout, colour schemes, interoperability and overall feel of the interface. As I mentioned, I road tested several solutions on 30 day free trials and I found myself frustrated and confused by many of them. By contrast, FreeAgent just felt right immediately. Navigation is a breeze. Their “overview” screen has been carefully designed to give you a wonderfully informative and intuitive landing page for your daily operations. Editing invoices and estimates is a joy due to their simulated “live view” of the document – i.e. you can see how it will appear to the client as you edit it. Affordable Monthly Subscription & Referral Scheme. As a one man business, I wanted a Cloud Accounting solution that didn’t nibble too much into my profits over the course of a year. At the time I made my decision, FreeAgent was not only cheaper than other providers but, on top of that, they were the only provider with a referral scheme – where each referral (resulting in a paid subscription) gives 10% off the monthly subscription for life for each party. I took up a referral (from an existing happy user) on the day I signed up for the FreeAgent 30 day free trial. This meant that, as a Sole Trader, I was immediately only paying £13.50+VAT per month (£15 -10%) + VAT to use their solution. As I am VAT registered this means a “true” expense of only £13.50 per month to my business. To me this feels like a very small monthly price to eliminate the painstaking, time consuming, stodgy old accounting system I had used for the last 15 years. Of course, the more referrals you get – the cheaper it becomes! As an iPhone and iPad user I was keen to sign up for a cloud accounting solution that also had a mobile option. The “Mobile Agent” App is designed to work with FreeAgent and runs on both of these devices. It allows me to sign into FreeAgent when I am on the move – check balances, log expenses, mileage etc. One feature I find useful on a business trip is the ability to take a photo of an expense receipt on my iPhone – then upload this using the Mobile Agent App. When I return to my home office and log into FreeAgent, the new expense is showing on-screen with the receipt photo neatly paper-clipped alongside it as an attachment. Accounting bliss! 3. How do I use FreeAgent? 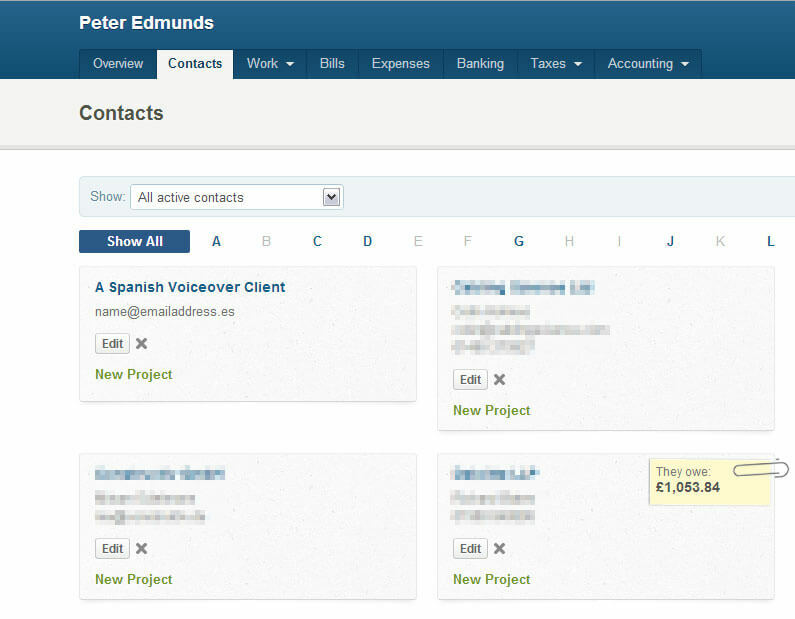 To give a flavour of some FreeAgent features in everyday use, here’s a snapshot. Its 9 am, Monday Morning and TWO emails arrive in my inbox…. 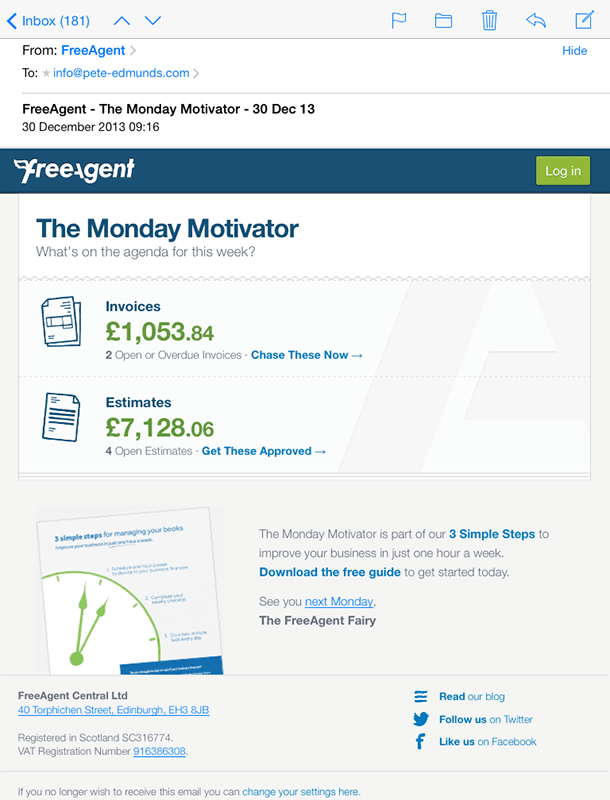 The 1st email is “The Monday Motivator” email from FreeAgent. This prompts me to chase up Overdue Invoices and convert Estimates into paid jobs. Working for yourself requires constant drive and motivation so these Monday morning nudges are very welcome to kick-start the week. When you create an invoice you always specify “payment terms” (e.g. 30 days) and from this a Due Date is added to the invoice (to prompt the client) and to your accounting system so that it can be tracked and flagged when overdue. Should you need it, the system is smart enough to send automatic email payment reminders to the client and an automatic “thank you” message when the invoice is paid. A useful alternative to requesting payments by bank transfer instruction on your invoice, is to embed a Paypal or GoCardless button at the top of your electronic invoice, allowing the client to click and process the payment quickly online. I decide to leave chasing my overdue invoices until the afternoon and use the morning to focus on new business…. The 2nd email is from a Spanish company, requesting a Voiceover quote as the British narrator on a 15 part TV series about football.This could be a dream job! I haven’t worked with the Spanish client before so my first task is to enter the client details into the FreeAgent “CONTACTS” screen. There are two viewing options; Vertical List or Grid (my preference as it feels like business cards across the page). The Grid viewing option also reveals FreeAgent’s sense of fun and practicality as it shows a paperclip and note attached to any client with outstanding invoices. Neat! Click the thumbnail for a detailed view of the Contacts Screen (Top Left only). Periodically, I use the FreeAgent “Export Contacts” feature to download all my Client details in VCF file format. 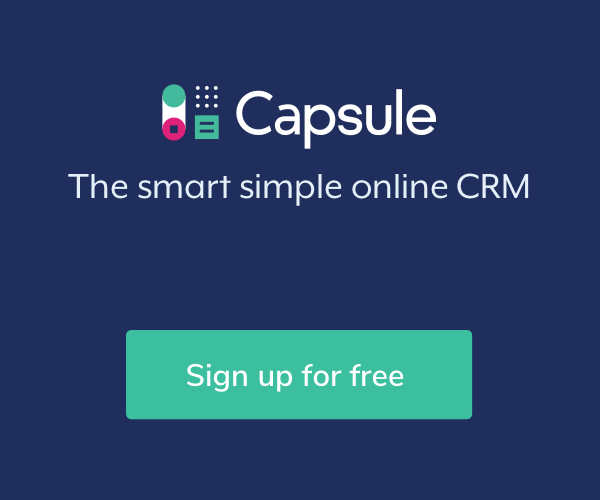 I can then import them into a cloud-based CRM tool for business development. In the voiceover industry, the time from enquiry to recording can be very short (sometimes 24 hours or less!) and this is where a fast, streamlined solution like FreeAgent can come into its own. Now I have the new client details in my system, I can very quickly produce a detailed Quote/Estimate using one of the built-in templates or a custom template. 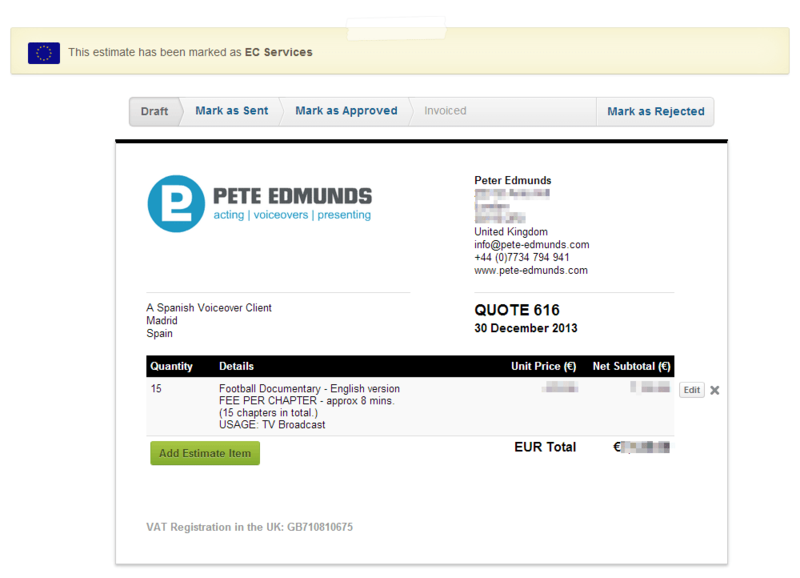 As with invoices, you edit the lines of the Quote in “live-view”, meaning that you view the layout of the quote just as the client would see it. Below are three of the built-in templates to give a flavour of what’s possible; Left to Right – UNION, HORIZON, and BAUHAUS. Click on the thumbnails to view the large version in a light-box. As you can see, the “Quote” screen has a bar across the top showing the progress of your quote. You can download your Quote as a PDF to attach to an email and would then “Mark as Sent” manually. Otherwise you can email to the client directly from within FreeAgent which will automatically “Mark as Sent”. When emailing from within FreeAgent you can also create email templates to speed up the process. In this case, the quote is in EUROS, as requested by the client. However, when the quote value is logged, FreeAgent will also convert it to GBP (at the prevailing exchange rate) so that on the “overview” screen I see the Total Outstanding Estimates value in my local currency – British Pounds. Like I said, they seem to have thought of everything! 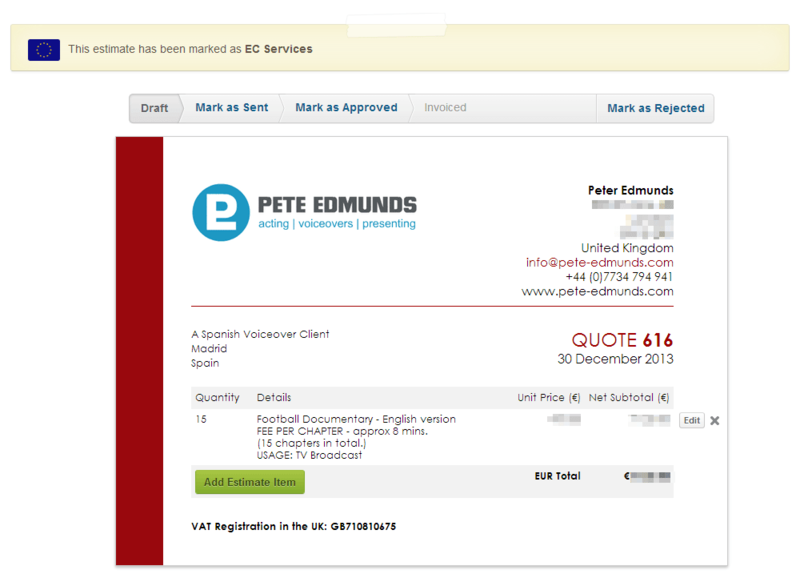 On this particular Monday, I send my Voiceover Quote in PDF format from within FreeAgent to the Spanish Client. All being well, my quote will be converted into business, marked as “Approved” then as “Invoiced” and finally paid. If your competitors are writing their quotes into the body of a basic email – think how much more professional you appear sending a branded, beautifully laid out PDF quote. Out of interest, the company logo branding is easily done by uploading an image when you first set up your business profile on FreeAgent. Next, as part of my daily accounting, I spend some time checking and marking my bank transactions from the direct feed via Yodlee. I use a personal bank account for business, so FreeAgent’s intuitive transaction matching is helpful to quickly sort the wheat from the chaff. Click the image opposite to see a snapshot from 30-31 Dec 2013. The 5 coloured icons at the foot of the image show the “flags” that FreeAgent uses. On 30th Dec the Sasco calendar purchased from Amazon is a business expense so I mark this as “Explained”. Conversely, the other Amazon transaction is a personal purchase and this is left as “Unexplained Personal” – as are the flurry of visits to Sainsburys to stock up for New Years Eve!. If we do some time travel to 31st Dec we see an outgoing payment to HMRC for VAT which is also marked “Explained”, since it relates to my business. I’ve touched a little on the Overview Page and this “dashboard” is a useful snapshot of your business at any point in time – showing Cashflow, Invoicing and Estimate values, Bank balance/chart, Expenses/Bills, and Profit/Loss and Tax Timeline. There are a some features on this screen that I haven’t had cause to use thus far such as “Projects” and “Timeslips” but these are powerful features that many freelancers need. The video below is an excellent introduction to the Overview Page. I hope the above has given you a feel for the benefits FreeAgent can offer your business – whether a Freelancer like me OR a small business with several employees. As always, it’s good to do your own research but I hope I’ve given you food for thought and perhaps saved you some time in your own decision making.